Hrmm....it seems despite some of us not wanting our pictures up on other sites, pictures of me ended up on a Russian site of Miss H's, given to her by Miss J no doubt or perhaps by her co-conspirator who took the pictures. Bad form Miss J, it just shows your true nature. Guess my picture is famous around the world then. This is Xenia and I after she had given me a few sweet kisses on the cheek, and she thanked me for helping take care of her. What a sweetheart she is, very lovely person and a very loving mother. More kisses from Brian, such a friendly and sweet guy. 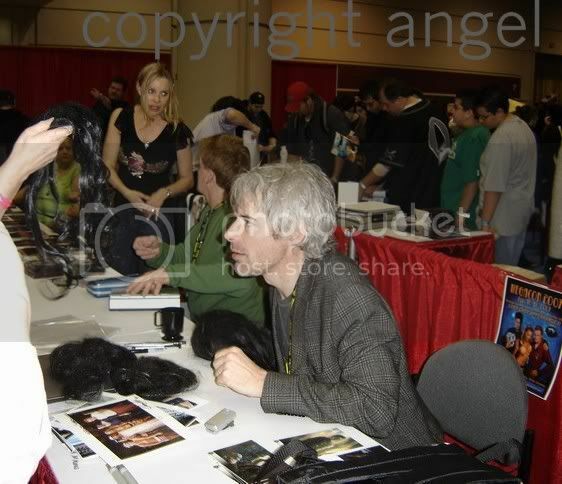 And a picture of me with Michael after he had signed my pictures, no kisses, but we did shake hands. And here I am keeping an eye on Michael's laptop and table as he's away doing his interview, he asked me to keep an eye on his table and I was more than happy to. 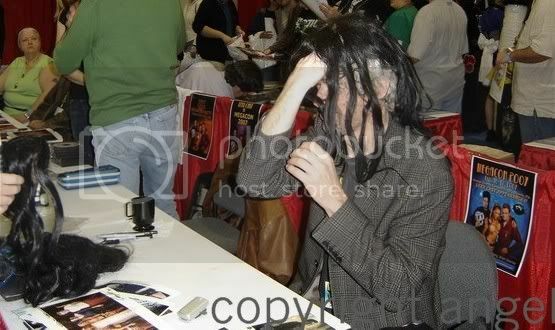 I got to meet some fans that came over for his autograph and I told them when he'd be back, and they did come back later. 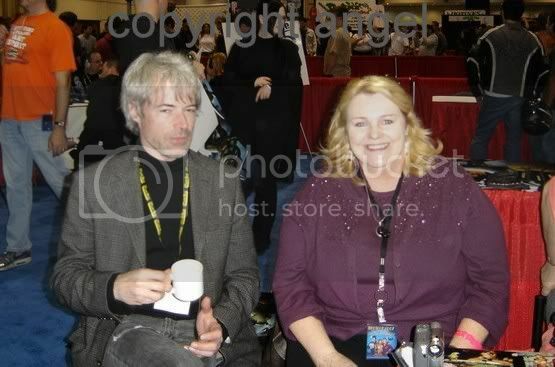 And here's one of the notorious (hee hee) Maya with Michael relaxing for awhile at the cast table. 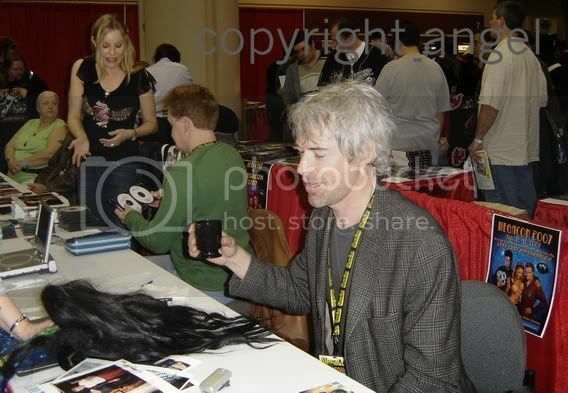 I am working on some pictures I took of Michael as he was trying on the Kai wig/bun/lovelock and curls that Veyron had brought and Kathy and maya are purchasing, Kathy brought it to the table when she was getting some autographs, I should have those done in the next day or so, so stay tuned! It was such a blast hanging out with all of them, and such lovely people they all are. awwww my beautiful girls, I can feel the love echoing off the pictures! Such a lucky bunch to be with the cast and enjoying their company one on one...a magical moment..
Aww those are great pics!! Thanks for posting them! Ketana wrote: awwww my beautiful girls, I can feel the love echoing off the pictures! Such a lucky bunch to be with the cast and enjoying their company one on one...a magical moment..
Aww, Nena, you should have been in those pictures too. I missed you so much not being at the con, My Crazy Ketana. Let's not let two more years pass before we all see each other again. And thank you to every one for the lovely comments. Great pictures! Radiant smiles from you girls! YOU BAD BAD GIRL !!! Well since the Russian site decided to put pics of me up (because they were given to them by someone with a grudge against me) I decided to put my OWN pics up. I guess I''m so famous now that the Russian site has decided plaster my mug over a whole page, *wow, lots of bandwith there* so now if anyone has the least interest in what I look like, they can come here now instead of enduring the grainy surreptitious shots done by someone for purposes of potential embarrassment. Guess what? Not bothered, I bet that just chaps them... BWAHA. These are great Angel, you look positively died and went to heaven radiant. And Maya, you're a gorgeous blonde! mayaXXX wrote: Well since the Russian site decided to put pics of me up (because they were given to them by someone with a grudge against me) I decided to put my OWN pics up. I guess I''m so famous now that the Russian site has decided plaster my mug over a whole page, *wow, lots of bandwith there* so now if anyone has the least interest in what I look like, they can come here now instead of enduring the grainy surreptitious shots done by someone for purposes of potential embarrassment. Guess what? Not bothered, I bet that just chaps them... BWAHA. Embarassement? Naw! They just adore the notorious Maya! Hey how much you charging for autographs now that you're famous? 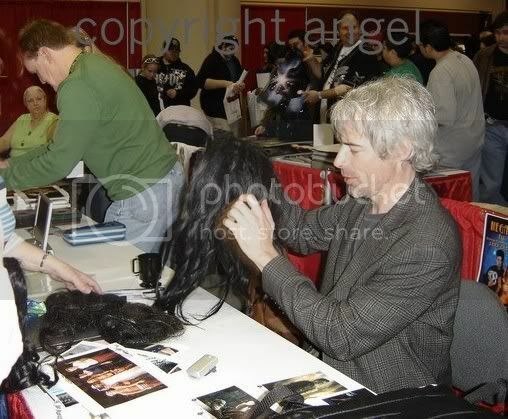 Veyron brought the Kai wig to the con, I believe it was in three pieces, and CheshireKat and Maya are purchasing it. 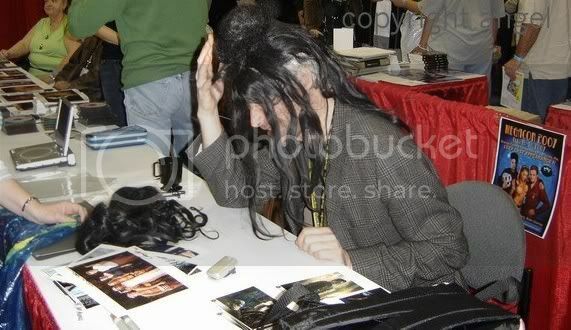 CheshireKat brought it to the table when she got her autographs and there's a story behind these pictures of Michael with the wig. There were two parts to the bun, the bottom part of the bun had a wire base built into it. Michael said he still had dents in his head from wearing that. He said, "Hey you try wearing that for 12 hours a day." He then proceeded to talk about how in season one the wig builder knew what she was doing, in season two he had the best wig builder of all, season three, she didn't get it, but she did it anyway, and how on season 4 we told him we thought the bun was the smallest it had ever been and that he was totally surprised we realized that. 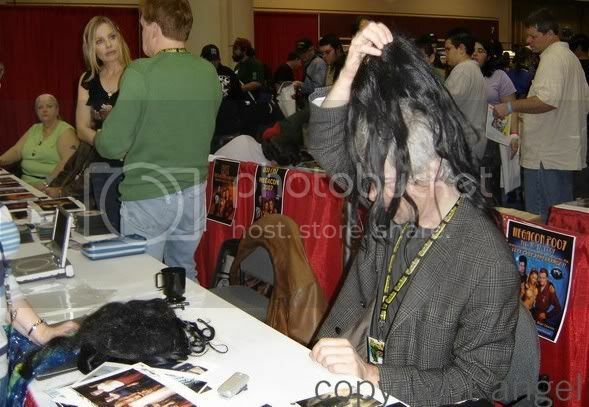 Michael played with the wig and goofed around with it at the table on camera, it will show up on the lexx table signing video when it's released. These pictures are my personal pictures, and are not to be uploaded anywhere else without my permission, you may save them for your self, but do not display them any where else on any other site. Dreams of Kai wrote: These are great Angel, you look positively died and went to heaven radiant. And Maya, you're a gorgeous blonde! Yeah the bottle does marveslous things, hehehe Thanks honey !